If you’re a new business, it’s hard to imagine yourself as the market leader. This is especially true of people starting businesses in well-known, traditional fields such as restaurants, accountants, fitness coaches, and the list goes on. While some startups are launching completely new products or services, most people are starting new businesses in well-understood, mature sectors. 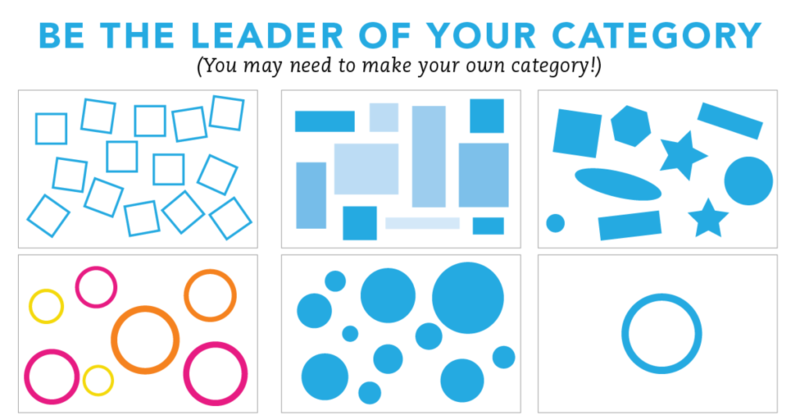 If you have a business that is in a well-defined, recognizable field, thinking strategically about your “category” can help you stand out. Let’s look at fitness coaches. You don’t want to compete against every trainer in your city, you want to define a specific niche for your service and then dominate that specialty. Most trainers (as well as restaurants, retail stores, lawyers and more) work in a specific geographic area, so that is the first way to define who you are competing against. Think about how your location can help you dominate—are you on a well-traveled route, do you offer parking, are you close to certain neighborhoods or businesses? A limited, focused client base is a well-regarded way to define and lead a category. Maybe you focus your training sessions on strength and balance for older adults. Now, you are no longer competing against the larger pool of trainers, you’ve shrunk your competition. An added bonus is that as you narrow your specialty, you are able to market much more efficiently. If you’re trying to attract all people of any age range, it’s hard to choose the right photographs or messaging so they feel connected to your service. But if you decide to focus exclusively on seniors needing strength and balance help, you can much more easily create a web site, printed materials or use social media to promote a clear message about the benefits of what you offer. Maybe you focus on in-home personal training; that means you’re no longer competing against the trainers at health clubs and gyms, but you may be competing against DVDs. When you go to a client’s home you’ve now introduced a clear benefit (no travel time, parking hassles, etc.) and reduced your competition. How you price your product or service helps to define your category. Face it, as much as you might like Sonic or Five Guys, you probably don’t compare them with a 5-star restaurant meal. It’s pretty universal business advice to avoid being the low-cost provider; unless you are using technology to change the entire product or delivery model. You can see how we took a huge, competitive market that would be hard to compete it—fitness coaching, and made it into a tight niche that you could really dominate: Fitness coaching serving upscale seniors in their homes in the affluent northern suburbs of Chicago. Once you have this category, you can see how easy it would be to create marketing that targets this niche. I see pictures of healthy seniors, in their nice homes, getting personal training. I can also start to imagine where I would and would not place my marketing. There’s no reason to waste time on snap chat, if seniors is your target market! But doing a free workshop at an upscale retirement community on the north side of Chicago would be beneficial. Think about what makes you and your product or service really unique. The more you are able to focus, the more likely you will be able to dominate. Tip: You’ll be asked to answer questions about your category more than once in Branding Compass. Your first answer is your “cocktail party” answer: very basic. We use this to help prompt you to refine your answers. Then, try to add in more details or more specialization to really narrow your competition.